"Blame is the absence of accountability." When we imagine relationships in a "power-with" environment, many tend to focus on the "with" — the gentle, connecting qualities such as being valued, empathy and care. These are essential skills of the Conscious Leader that we introduce in the "Connect First: Bringing conscious presence into the workplace" sessions. Equally essential are the skills that enliven the "power": the fierce connectedness that leads us toward fulfillment of our shared purpose. Connection matters. And so does Purpose. Conscious Accountability within an environment of intrinsic motivation looks very different than the accountability that we associate with blame and punishment. There are new levels of self-awareness to embrace and new skills to learn. That's what this series is about. We will apply the self-awareness and self-responsibility that we learned in the "Needs-Based Communication (NVC) CORE CONCEPTS" foundations to real workplace needs for feedback and accountability. The Conscious Leader is both gentle and fierce. This course helps us develop the fierce side. Session 3: Mutual Accountability: ​"Calling in" to alignment rather than "calling out"
This workshop is an interactive, activity-based experience where participants are invited to learn through self-reflection, interactions in pairs or small groups, and engagement with the whole group. Workshops combine innovative, interactive strategies with essential principles of leadership and communication to create a robust learning experience. Our new Training Subscription Plan provides unlimited access to all publicly scheduled live interactive video workshops in Basileia's "Conscious Leader Development" program, and is priced between $100-$150 per person per month. Designed for flexibility and affordability, the Training Subscription Plan provides unlimited access to Basileia's full set of live interactive video workshops that are in Basileia's public training schedule. Whether you are an individual who wants to hone your Conscious Leadership skills or an Executive Director or CEO who wants to enhance the skills of your entire leadership team, the Training Subscription Plan provides a cost-effective and flexible approach that ensures training impact. This workshop helps you navigate that "space ... between stimulus and response." For most of us, it is a space where we can easily be triggered into the reactive "fight, flight, freeze" area of our brain. When we think and act from that fear-based place, our effectiveness and impact are diminished, especially as leaders within an organization. In our values-based leadership assessments, this behavior shows up in the leader’s "personal entropy" score, where personal entropy is defined as the amount of fear-driven energy that a person expresses in his or her day-to-day interactions with other people. Needs-Based Communication (NVC) is a potent process that stimulates new insights and gives us new tools to bridge the space between unconscious reaction and conscious response. It invites us to "stop playing the blame game," by enhancing our self-awareness and self-responsibility. At the same time, it enhances our ability to communicate and collaborate with others in challenging conversations, when emotions are rising, even when we seem to be heading into conflict. Though this is a foundational workshop in our Conscious Leadership Development programs, it is essentially a course on "Leading Yourself" ... and so it's really a course for anyone ready to enhance self-responsibility for their own life. And while there is a workplace focus on these sessions, participants are also invited to use personal or family situations in terms of applying the process if they choose. The skills and the mindsets are the same no matter where they are applied. This series focuses on core concepts of NVC, and is a pre-requisite for more advanced training for Conscious Leadership, e.g. Conscious Conversations, Conscious Accountability, Building Conscious Teams, etc. NVC guides us to move beyond blame. To recognize our own reactivity. To understand our reactivity in terms of what matters to us. To see another person's reactivity in terms of what matters to them. In that understanding, we can make choices and take actions that are more likely to advance all of us toward what matters to each of us. ​Needs-Based Communication invites us to expand our perception so that we see ways to bring connection amidst conflict. At the core of this expanded perception is the skill to focus our attention on the underlying human needs that are seeking to be nurtured in any moment, both within ourselves and within the people around us. These underlying human needs are the motivation for our actions and our words ... the "why" behind what we do or say. Because human needs are universal — they are common to all human beings — when we bring them into explicit focus, they tend to stimulate understanding and draw us closer together. empathically listen to the feelings & needs of the other. These are radically different choices than we are accustomed to experience when we are in conflict: namely, fight, freeze or flee. While simple, NVC is often challenging to embody because we are so deeply conditioned to perceive each other through judgments and blame. With practice, the process of NVC helps us navigate within ourselves to transform unconscious reactions into conscious responses. NVC is not about being nice; it's about being real. It's not about stifling intensity, but transforming it. NVC is not about changing other people or getting them to do what we want. It's about changing ourselves, so that we inspire the quality of communication and relationship that we want. NVC is not a technique or formula. It's a process that helps guide our consciousness to a new awareness around human needs. ​Our workplaces and our homes will become more vibrant when there is greater trust and care, and less fear and blame; more conscious responses among us, and fewer unconscious reactions; more listening to understand, and less listening just to respond. Needs-Based Communication is a pathway to take us there. First, human needs are the heart of the process. Secondly, I have wanted to avoid the common initial reaction from people in business that "... we're not a violent place." I have chosen to keep the "NVC" abbreviation for Needs-Based Communication because many people are familiar with NVC as a process — and it lacks the "nonviolent" connotation. 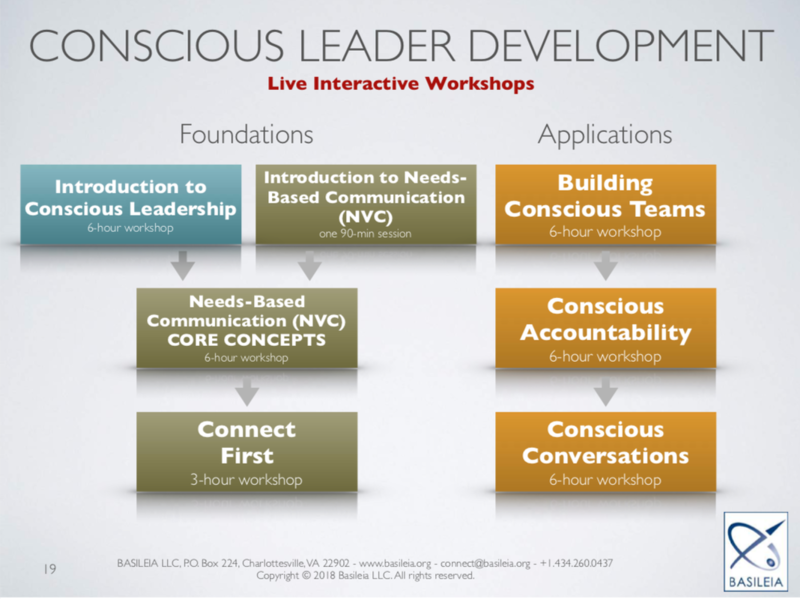 I am excited to announce the redesign of the live interactive workshops within the Conscious Leader Development programs at Basileia LLC, including a new workshop format using live interactive video technology. People world-wide can participate in open-enrollment video workshops. I am thrilled that our new live interactive video workshops enable more people around the world to learn the skills of conscious leadership. I invite you to have a look at the details about each workshop, including the ability to register online for open-enrollment video workshops, using the links above. I hope to see you at one of these workshops soon! In a trust-based organization where people are valued, crying is recognized as a fundamental way that human beings respond to the world around them. There are many reasons why we cry, and one of them is when we touch into the energy of what really matters to us. THAT's the energy that a conscious organization thrives on ... a shared purpose and an embodiment of our core values that moves us to tears at times. I remember with fondness overhearing a conversation of a colleague who was inviting an emotionally upset business acquaintance to come to our offices to talk. The business acquaintance expressed reluctance to come because she knew she would likely be crying. My colleague assured her, "we cry all the time around here ... come on over!" In fact, what we had, and what every organization needs, are structures that recognize the human need for empathy (much as every office has bathrooms and a kitchen for other human needs). In our offices, we created a "gold room" that had soothing gold walls, very comfortable seating and a couch, music with high quality speakers, lots of plants, and adjustable warm lighting. It was a place people could go when they just needed a little time for themselves, or needed empathy from another person. Our Gold Room became a symbol to everyone of how much we valued the human experience in our workplace. And it was the place that my colleague and her business acquaintance went when she arrived. We also need structures and skills in our meetings so that when a person becomes emotional or tearful, we can hold the space with care and empathy, and invite them, if needed, to seek the space or the care that they need. It takes self awareness, emotional intelligence and skills of empathy for a leader to show up with such a quality. The acceptance of crying in the workplace is a direct measure of where the organization is on the spectrum of leading through trust vs. leading through fear. In this 5-part series, participants are introduced to the foundations of Conscious Leadership — leading through trust rather than fear, leading through power-with the people you are leading rather than power-over them. Each of these sessions highlights a core facet of Conscious Leadership, and collectively they provide a pre-requisite foundation that prepares you to delve more deeply in learning specific skill sets when you are ready. Note that the sessions may be taken in any order or as individual sessions — each has been designed to be a "whole" learning experience. Session D: How am I Showing Up as a Leader? Each of these live, interactive, 90-minute video workshop sessions will be facilitated by Gregg Kendrick. ​For more details and to register, click here. 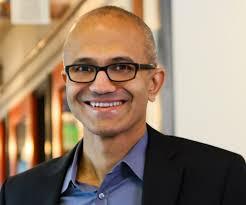 Nadella also includes Marshall Rosenberg’s Nonviolent Communication among the short list of books upon which he’s drawn inspiration (The 7 Books Microsoft CEO Satya Nadella Says You Need to Lead Smarter, by Harry McCracken, Fast Company, September 18, 2017). As a resource to those training in or learning Nonviolent Communication™​, we have been providing a no-cost limited license to use our introductory training materials for more than eight years. We have just added an updated version of these materials to the Resources page of our website which can be downloaded as a PDF. This 22-page workbook includes the core pages from Basileia's training materials for the "Introduction to Needs-Based Communication (NVC)" workshop. We typically teach this workshop in a 1- to 2-day format for people who are new to NVC. Hope that these materials will be useful for your personal learning or in group training sessions or practice groups! Gregg Kendrick supports leaders to activate the human potential of themselves, their teams and their organization.